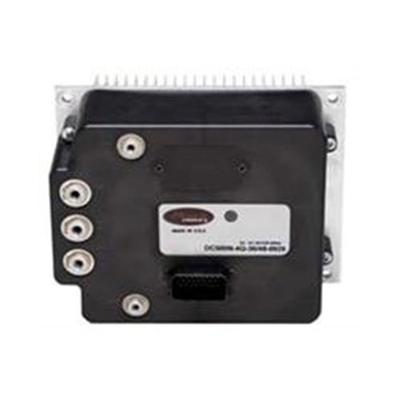 DC500N-4Q PWM DC drive was developed and designed for battery operated, electric vehicles with separately excited DC motors. DC500N-4Q safety features for safe integration into electric vehicles include runaway and rollaway protection, battery under-voltage control and protection from overheating. The DC500N-4Q drive detects when battery voltage drops too low and will gradually boost the field current to compensate. This prevents intermittent operation of the vehicle and provides torque to get back to the charging station. The DC500N-4Q drive heatsink has a temperature sensor that at 60 degrees C triggers a warning signal along with automatic field current boosting and armature current cutbacks to help keep the drive below the shut down temperature of 85 degrees C. The warning signal generates progressively faster beeps as the temperature increases beyond 60 degrees C.
Configurable safety parameters, such as speed limit, current limit, and braking amount are set via any terminal program on a Windows based PC. Connection to the DC500N-4Q drive is via a standard DB9 female-male serial cable. Additional DC500N-4Q features are an alarm signal when in reverse, regenerative braking which charges the battery, an input to select more torque and less speed and outputs for an hour meter and a speedometer. For battery-powered vehicles: Industrial or recreational. Programmable parameters: Set values with any Windows terminal program via RS232. Peak Current: 500 A for 2 minutes. Fault detection: Flashing LED signalization. Runaway protection: High throttle fault detection. Rollaway protection: Heavy braking with beeper signal prevents rollaway. Hour meter signal: Provided only when motor is powered to track usage hours. Back up alarm signal: Alerts area of reversing vehicle. Isolated output for speedometer: Frequency output directly proportional to vehicle speed. Turf/hill mode: Optimizes motor operation for more torque and less speed. Regenerative braking: Regen energy used or stored to extend battery charge range. Under-voltage control: Torque maintained even when battery charge gets low. Extended battery range: An advanced speed limiting algorithm optimizes motor operation to run cooler and extend battery charge range. Full H bridge: Allows for low power direction switching. Internal pre-charge circuitry: Prevents arcing on main contactor and extends its life. Overheat protection: Temperature sensor triggers gradual field current boosting and armature current cutbacks to protect drive and motor from overheating.